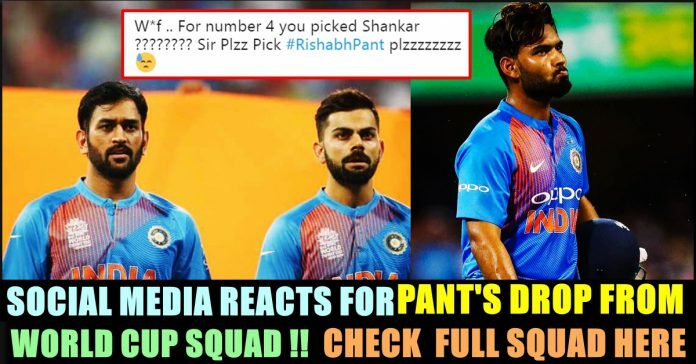 Rishab Pant & Ambati Rayudu Not Included In World Cup Official Squad !! Here’s How Internet Reacting !! The most awaited World Cup squad announced by the official twitter page of BCCI this afternoon. The list has Virat Kohli as captain and Rohit Sharma as Vice captain where as experienced Dhoni named as Wicket weeper. Before announcing the squad, only four or five players were predicted by the squad to be in the World cup squad. They are Jaspirit Bumrah, Mahendra Singh Dhoni, Virat Kohli Mohammad Shami and Rohit Sharma. Other then them most the players to be in the world cup squad had tough competition between them. Kedhar Jadav, Rishab Pant, Suresh raina, Ambati rayudu had tough competition for the middle order position. I don’t know why I had soo much trust on him ! Previous article19 Year Old Youth Died While Doing A Tik Tok Video !! Police Arrested Three Of His Friends !! Next articleExcept This One Team Every IPL Team Celebrated India’s World Cup Squad Announcement !! Check Why ! !